Product #16375 | SKU INDI-GRIDGP | 0.0 (no ratings yet) Thanks for your rating! The Power Grid System Single Canon LP-E6 Type Battery Plate for GoPro from IndiPro Tools allows you to power your GoPro camera using an available Canon LP-E6 type battery. The unit converts the voltage of the Canon LP-E6 type battery to regulated 5VDC power for the GoPro. The battery plate incorporates a clamp so you can mount it to LWS 15mm support rods, and it features a mini USB connector that connects to the camera's power port. The battery (not included) snaps in to the plate, and it stays secure during normal use, as you must press a small tab to remove the battery. A green LED built into the plate lights up to indicate sufficient voltage to power the camera. The Power Grid System is made in the USA. 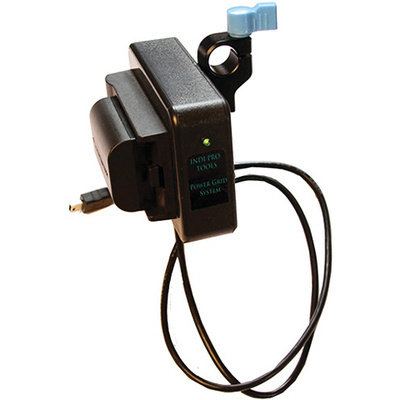 Powers your GoPro camera using a single available Canon LP-E6 type battery. Integrated single rod clamp for 15mm support rods, allows you to mount the Power Grid System in a variety of positions. Battery securely snaps into place and a release tab must be depressed to remove them, which means that the battery remains attached during normal use. A built-in green power LED provides confirmation that the Power Grid System is supplying enough voltage to power the camera.